Our product range includes a wide range of ss 904l fasteners, ss 317l fasteners and inconel 625 fasteners. SS UNS N08904 Washer, Stainless Steel 904L Nylon Insert Nut, 904L SS Double Ended Stud, DIN 1.4539 Fasteners, Stainless Steel 904L Threaded Rod Manufacturer & Stockist. ... Alloy UNS NO8904 Fasteners is a reasonable solution for a lot of functions where the 300 series of alloys are inclined to chloride SCC. 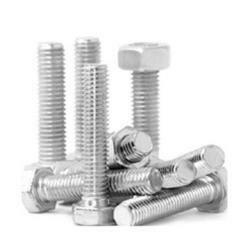 AHAPURA STEEL AND ALLOYS is one of the pioneer distributor and trader of Stainless Steel 317L Fasteners (Bolts / Nuts), which is produced in an electric arc furnace where carbon electrodes contact recycled stainless scrap and various alloys of chromium. A current is passed through the electrode of Stainless Steel 317L Hex Head Bolts and the temperature increases to a point where the scrap and alloys melt. When specifying, Stainless Steel 317L Hex Head Nuts can be used but it is important to also list the specific Unified Numbering System (UNS) designation for the specific alloy, which identifies the specific chemistry that is desired. Temperature Range 1800degree F (1000degree C). Looking for SS 904L FASTENERS ?